With all the discussion of the use of chemical weapons in Syria, it is perhaps worth remembering that their first use against a Western Army at any scale took place at the Second Battle of Ypres almost one hundred years ago. My grandfather was there, serving in the Northumberland Fusiliers, and this is an account of that battle. In August 1914, at the beginning of the First World War,, the German armies marched through Belgium, hoping by avoiding the French fortifications at Verdun, to swing around and capture Paris. En route they ran into the British Expeditionary Force, (BEF) and initially drove this, and the French armies back into France. A counter-attack in September pushed the German Army back to a line, running from the North Sea to Switzerland, that was the sensible length of the battle fields until the closing months of the war in 1918. The Belgians has opened the sluices to flood the ground west of Ypres. Figure 1. Troop movements leading up to the establishment of the trench line. By this time a large proportion of the BEF, which included most of the experienced troops in the British Army, had suffered considerable casualties, and as 1915 began they began to be replaced by troops from Britain. At the same time there was massive enlistment in the British Forces, averaging 125,000 men a month. Such was the case with my grandfather, who joined the 7th Battalion of the Northumberland Fusiliers on October 19, 1914. The battalion was send to Le Havre, on the 16th April, 2015. From there they were marched forward, and held in GHQ reserve as part of the 50th (Northumberland) Division around Steenvoorde and Cassel, some 20 miles west of Ypres. 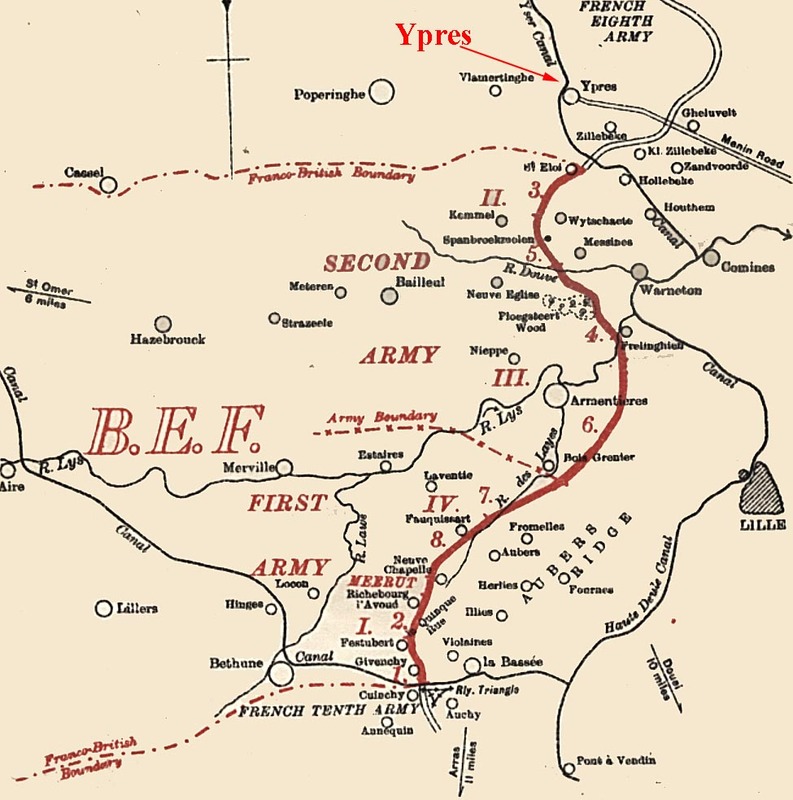 At that time the British Army held the line running south from Ypres, with French and Belgian troops mustered from their North to the sea. Figure 2. Location of the British Armies at the end of 1914. By this time troops had dug trenches, with simple barbed wire entanglements, but these early dugouts were shallow. Because the water level was about 2 feet below the surface, the trenches could not be dug any deeper than that, and often were only about three feet wide. Full height was thus achieved by building up sandbag walls to a height of about four feet. In front of these trenches the wire entanglements were placed stretching continuously and over a width of perhaps 6 yards. On the 14th April a captured prisoner (August Jager) revealed that the Germans were planning an attack for the following day, and that they planned to use gas. The French general requested that his men be withdrawn but was over-ruled (and after the battle dismissed). Jager, some 17 years later, was arrested in Germany and sentenced to 10 years for treason. Nothing else was done. There is some evidence that gas was used for the first time the following day. However the gas was fired from shells and was not widely effective. 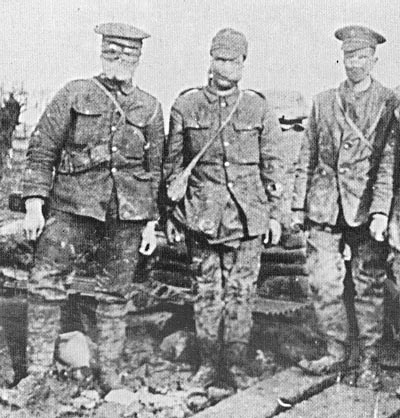 German records revealed that Chloracetone, Benzylbromide and Benzyliodide were used in shells before the Battle of Ypres. Some 3 000 shells loaded with dianisidine which irritates the mucous membranes had been tried, with no effect, at Neuve Chappelle. This was changed to Xylyl-bromide and the shells marked with a T. (This led to Allied confusion and interpretation of these as tear gas shells, in fact the effect is mainly on the eyes but in stronger doses it can cause edema of the lungs,) While these had some effect, the shells were initially lined with lead and this reduced their effect. They had only little effect on troops before the main battle. The 22nd of April began as a beautiful spring day , at around 5 pm, 5,700 cylinders of chlorine, located along the German lines and about 3.7 miles long were opened in the space of 3 minutes. Each container held 44 lb. of liquid which vaporized as it escaped. (A total of 120 tons of chlorine).. 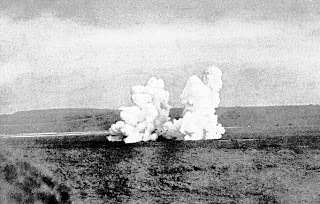 The gas then spread over land which, at that time was still being farmed, and formed a cloud which rose to a height of 10 - 30 yards and moved over the ground at a speed of around 1 mph. 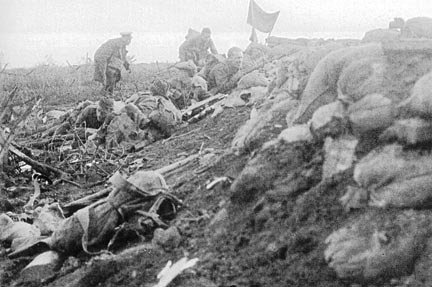 After ten minutes, to allow the cloud to reach the trenches 40 yards away, the German guns opened up in a barrage. By 7 p.m. the French guns had stopped. The Germans advanced until they met the Canadian reserves , who had been called up, and had advanced just beyond Mouse Trap Farm. In the ten minutes that the gas took to pass over the lines, 5,000 French had been killed, 15,000 gassed, and 6,000 were captured together with 51 guns and 70 machine guns. There were virtually no survivors left in place, but those left retreated to form a new line. Figure 4. German First Gas attack. South of the French the line was held by Canadian Divisions, but a series of large gaps rapidly grew between these troops and the remaining French. This gap was some 2 miles long. By 9 p.m. the gap had grown to 4.5 miles except for only three places, at the Polcappelle road held by the French Tirailleurs, and the 3rd Canadian Brigade, by 2.5 companies at St. Julien and by four companies around Mouse Trap Farm. This line was some four miles from the backs of the 27th and 28th divisions on the other side of the salient. 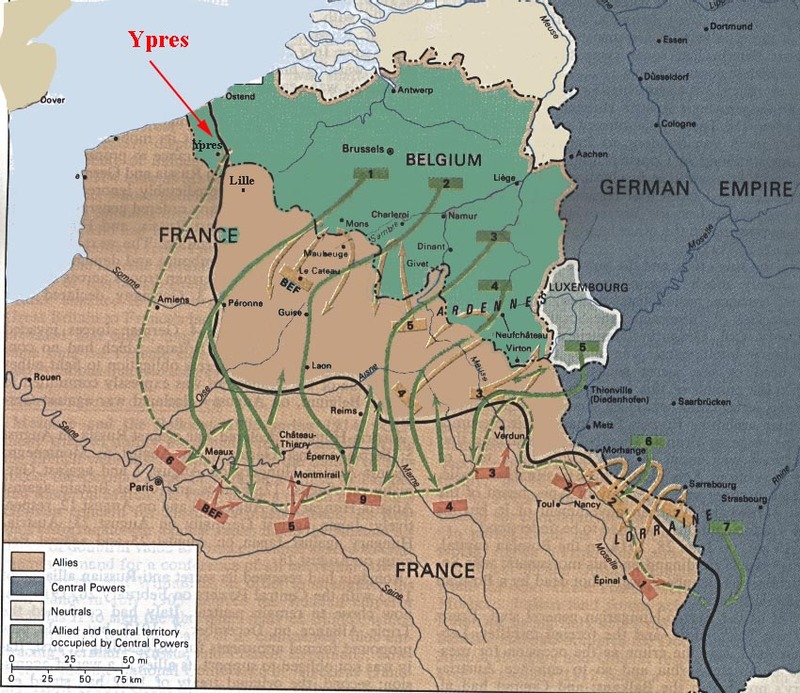 But at 7:30 pm German troops stopped advancing and began to dig trenches and a new gas line. Figure 5. 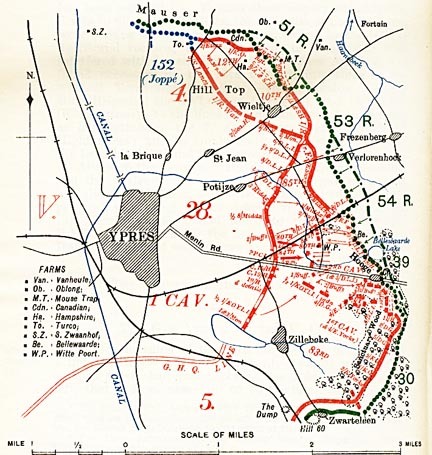 Position of troops at 5 pm on 22 April 1915. To provide new troops the 50th (Northumbrian) Division, which was 20 miles away at Steenvoorde, was ordered forward. Arriving in France on the 16th April it consisted of the 149th (Northumberland), 150th (York and Durham) and 151st (Durham Light Infantry) Brigades. It was the first full Territorial Division to reach the front, some being sent forward by bus. At midnight the Canadian 45th Division counterattacked the German line with success but without adjacent support, it had to be withdrawn. (The 2 battalions were reduced to 10 officers and 400 men). Messages between forces were being sent around by foot and by mounted riders who got as near as they could on horseback before finishing on foot. Many runners did not make it, and communications were poor. It should be remembered that most of the troops, supplies, wounded etc. travelled over the same road network , and that troops had neither gas masks nor steel helmets. Figure 6. Troops lie in a field near a farm. 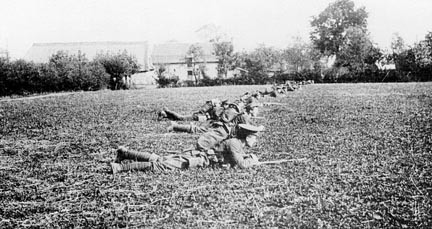 By daybreak ten battalions had been moved into the gap between the French and the Canadians but had little cover, and some lay in the open, while rudimentary trenches were dug. Facing them were some 42 battalions of German troops, heavily armed with artillery, machine guns and already occupying the ridges that crossed the area. The German guns outnumbered the allied by more than 5 to 1. . The following day also began with perfect weather, with little enemy activity as the allies tried to decide how to defend against the gas. The idea that they used was to hold wetted cloth (handkerchiefs or what was available) over their mouths, damped if possible with a solution of bicarbonate of soda. If it was too wet the men could not breath through it and took it off. This did not become evident until the next gas attack. 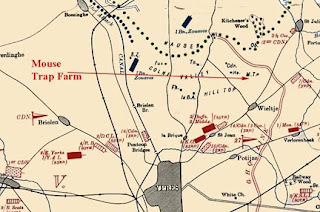 The British tried unsuccessfully to counter attack, using the 13th Brigade, but it suffered very heavy casualties. All the reserves had been committed and the 150th Brigade was brought forward in buses while the 149th Brigade were ordered to march to Brandhoeke. Three of the Colonels that had been commanding battalions were killed, together with 56 other officers and 2100 men. The 150th Brigade was therefore ordered up to provide support for the remaining troops. 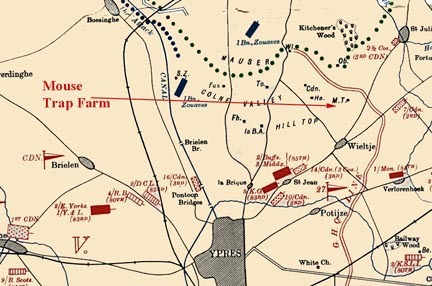 The flat land and troops could be seen advancing for a long way. 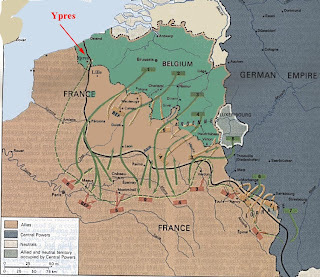 On the 24th April the Germans to turn the flank by attacking the Belgian army to the north. They also launched a second gas attack, at the Canadian troops. Again the gas was launched from cylinders, along a thousand yard front. 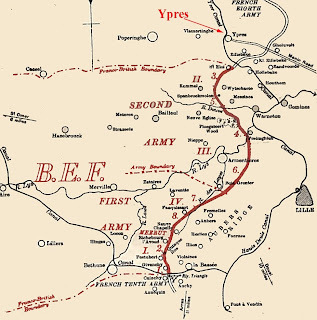 Some 24 battalions of Germans attacked the defending eight battalions, which had had little protection from the gas, and a mile-wide gap developed. Canadian forces then created a second defensive line behind the gap. 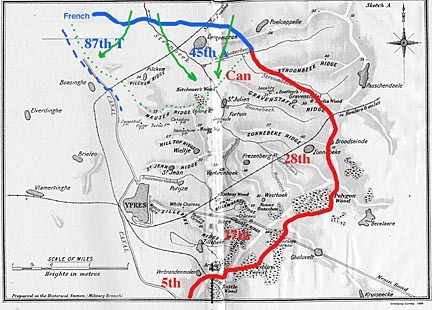 The strong German attack, however continued and by 3 p.m. the Canadians were forced to fall back through St. Julien, and were reinforced by 150th Brigade, counterattacking and halting the German advance. The 149th Brigade was to attack Kitchener’s Wood and St. Julien from the left, but as they moved forward they came under rifle and machine gun fire. They advanced within a hundred yards of St. Julien before they were stopped in place. The men were pinned down, and eventually retreated. The Brigade lost 73 officers and 2,346 other ranks. The German lines were well defended, and the British troops carried banners to show where they were, supposedly to help British artillery , but it also helped the Germans. Figure 9. British troops approaching German trenches, note the wire and the flags. During the day the Germans launched several heavy attacks further down the line and troops were called up as available to create a viable defensive position, although it was necessary to retreat on several points. German attacks continued all night By this time the 8th DLI had lost 19 officers and 574 men and was reorganized as a company of 6 officers and 140 men. The 149th were ordered to the south of Wieltje to act as a reserve. 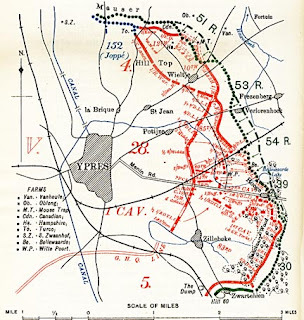 The Lahore Division had marched up at noon, and had been in huts 5 miles south west of Ypres. General Smith-Dorrien ordered that the Lahore Division should attack towards Mauser Ridge, They Lahore Division marched out at 5:30 am and lined up at 11 am. Moving forward to attack at 1:20 pm. They continued forward until they were within a hundred yards of the German lines, where they were halted. At this point gas was released from the German lines and although the troops held position in time they were withdrawn back to the British front lines, The Division had lost 95 officers and 1,724 men including 3 Lt. Cols. The Northumbrian Brigade “fared even worse.” Only the 4th 6th and 7th battalions were available. Brig. Riddell did not receive orders to participate in the attack until 10 minutes before it was due to start at 1:20 p.m. Neither he nor his men were aware of the British wire than ran obliquely in front of the GHQ line before them. The brigade had lost 42 officers and 1,912 ranks, over two thirds of its strength. “ My grandfather survived, though he was wounded, and was in hospital on the 5th May. He was back on the front lines when he was shot by a sniper in June, 2015, and was then invalided out to the UK where, after almost two years of treatment he came home. He was also gassed several times(German artillery were firing 40% gas shells at the time) and for all the time I knew him suffered with his breathing in the winter. Subsequently the German Army used gas around the salient, leading to a British withdrawal to a more defensible line. This was completed by the 3rd May and sensibly ended the Second Battle of Ypres. There were two subsequent gas attacks that month, but in the one on the 11th May the wind shifted, and two of the German battalions were caught in the gas clouds. By the time of the second, on the 24th May there were sufficient gas masks and material that the Allies were able to withstand the attack. British losses over the month were 2,150 officers and 57,125 men. German losses were 860 officers and 34,073 other ranks. Figure 10. Battle Lines for the gas attack on the 24th May. Figure 11. My Grandfather Private Archibald Summers.